Subject:- MODIFIED ASSURED CAREER PROGRESSION SCHEME (MACPS) FOR THE CENTRAL GOVERNMENT CIVILIAN EMPLOYEES - CLARIFICATIONS REGARDING. Reference is invited to the Department of Personnel and Training(D0PT)'s Office Memorandum of even number dated the lgth May,2009 regarding the Modified Assured Career Progression Scheme(MACPS). Consequent upon the implementation of Sixth Pay Commissions recommendations, the four pre-revised Group 'D' pay scales viz., Rs.2550- 3200, Rs.2610-3540, Rs.2610-4000 and Rs.2650-4000 have been upgraded and replaced by the revised pay structure of grade pay of Rs.1800 in the pay band PB-1. As per the recommendations of Sixth CPC, Government.sewants in these four pre-revised Group 'D' scales have been granted the Group 'C' revised pay structure of grade pay of Rs.1800 in the pay band PB-1. It has been decided on the analogy of point-5 of Annexure-l of MACPS dated 19.05.2009 that promotions earned or upgradations granted under ACP Scheme of August,-1999 in the past to the four pay scales mentioned above, which now carry the grade pay of Rs.18001- shall be ignored for the purpose of MACPS. However, promotions/financial upgradations earned by existing Group 'D' employees to grade pay of Rs.1900 (pre-revised scale of Rs.3050-75-3590-80-4590) shall be counted for the purpose of MACPS. 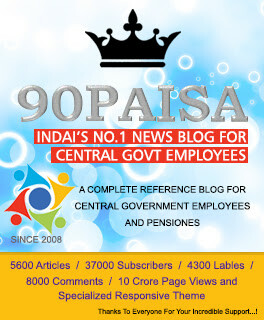 An employee in 5000-8000 scale on promotion to 5500-9000 scale in 2005 got notional increment and his pay Pay. On grant of MACP III will he get another 3% increment and diff. of grade pay. can any body enlighten on this aspect. pl. correct 'required qualification is 8th standard instead of 9th standard.' sorry for inconvenience. Mr. x was joined the railway as tech,gr-II in 1982 on completion of training, before promoting to tech,gr-I, he promoted to TCI-III/JE-II in may 1988,on intermedaite apprentice quota. In august 1997 he promoted to TCI-II/JE-I,now completed 11 years till 01.09.2008 without promotion,will he get any benefit in the MACP? MR 'X' WILL GET MACP BENEFIT AS HE HAS AREADY COMPLETED 10 YEARS SERVICE IN THE PREREVISED GRADE OF RS 5500/- TO 9000/- BEFORE 01.09.2008. Is a person eligilbel for gratuity if he serve a organization for five years or more. The organization belongs to a private school, which is affiliated with C.B.S.E. New Delhi, since 2003 to providing education up to class 10. Is the employee of an education society is eligible for the gratuity or not if s/he works for five years in same schools. Plz. note the school is affiliated with C.B.S.E. New Delhi and also deducting the EPF form its employe. After getting MACP benefit my Basic Pay is 14460 and Grad Pay is 4600. My basic pay 14460 is just equivalent to 7250 in old basic pay before pay commission and as per which I am entitle for Ist class Pass. but here officials are not allowing/giving the 1st class benefit to me saying that regarding this they have not received any clear cut instruction from Railway Board, and as I have got salary increment benefit, due to ACP scheme, I can not be given 1st class pass. Am I not entitle for 1st class pass, if yes, please give me any railway board circular copy regarding this so that I can show them. This MACP shcme has brought discrimation between the direct RRB recruits and deparmental recruits. Whereas RRB recuits juniors drawing more pay than their seniors in counter part in the same grade. The difference is very huge and feel being humilated due to this scheme as juniors are drawing more pay then senior employee. I have been appointed as TGT in 1979. Also a promotion offered to me in 2000 was rejected by me due to some financial reasons. Now my question is am i eligible for MACP for second and third financial upgradation. My 20 years of service have already been completed in 1999 and 30 years in 2009 on basis of stagnation. my date of Appointment is 28-4-1988 as LDC. I got 1st ACP after 12 yrs on 28-4-2000 in the scale of UDC 4000-6000(pre-revised). I got promotion to the post of UDC on Oct,2006. No financial benefit was given to me at the time of promotion. I want to know as per 6th Pay Commission, when I will get my 2nd ACP, in which pay band and what will be the grade pay. My present Basic pay is Rs.12150- and Grade Pay is Rs.2400-. I joined in a subordinate office in the post of Hindi traslator in the pay scale of Rs1400-2600 in July,1988 and got a promotion to the post of Sub-Editor(Hindi) in the pay scale of Rs.5500-9000 in April,1998. While implementing sixth pay commission report the grade pay of Rs.4600 was given to me considering the post as equivalent to Sr. Hindi Translator.Our office has nnot conbsidered my case for MACP stating that I have got a pay hike from 2006. Kindly clarify whether I am eligible for MACP? Can any one please tell me is it legal to cancel the benefit given by MACPS in the case mentioned above.